The city of Tampa is the county seat holder for Hillsborough County, located on the Gulf Coast of Florida. Tampa Bay is the local name for the four-county metro area that consists of the cities of Tampa, St. Petersburg, and Clearwater which together boast a population of over 2.7 million residents, making it the second largest metropolitan area in the country. Tampa has a rich history, having been populated by various indigenous tribes before being established as an outpost for the US Army in 1824. Fort Brooke (the name of the outpost) was built at the current location of Tampa's Convention Center. 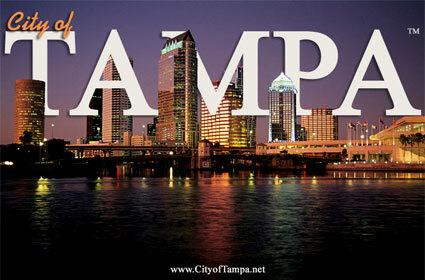 Tampa is a booming city, with an estimated population growth of about 97,000 people per year. The Bay area has an active night life and youthful crowd, in fact, Tampa was declared the top city for "twenty-somethings" by New York's Washington Square News. If your planning on moving to a big city with a young population and active nightlife - AND some of that wonderful Florida sunshine - Tampa Bay is the place for you..
Moving On Up, Inc.™ services the Bradenton-Tampa-Venice metropolitan region for all your local moving and storage needs. We are proud members of the American Moving & Storage Association (AMSA). Moving to Hillsborough County? Visit the City of Tampa's website for more information on neighborhood and community relations, arts and culture upcoming events, local schools, and general city data. The City of Tampa also has an in-depth Relocation Guide with local classifieds for real estate, automobiles, and jobs, as well as a lifestyle page listing all the fun and exciting things to do in Tampa. Moving On Up™ has included to the left links to the local sites of the cities and communities in Hillsborough County and Greater Tampa and real estate resources below. If you would like any additional help planning your move, call Moving On Up™ at (239) 495-7191 for mover rates and to learn more about our monthly moving offers. Moving On Up™ is conveniently located in Naples and able to help you with any moving needs. Give us a call at (954) 924-1522 to schedule an in-home estimate or book your move. Request a moving quote and get a FREE in-home visual estimate for an accurate, binding price.